In a headline-grabbing appearance before MPs on the House of Common’s liaison committee, prime minister Theresa May promised a long-term funding settlement for the NHS in the near future. This was widely interpreted as an indication there will be a ten-year plan set out later this year. But for managers and leaders on the front line the here and now is more pressing. As the new financial year gets under way, NHS Providers warns that the task for 2018-19 looks impossible. The organisation has published a report setting out how the health service is too short of staff, beds and money to achieve everything it is being asked to do. On staffing, it points to figures from NHS Improvement showing that one in 12 jobs, including more than 35,000 nursing posts, are vacant. On bed capacity, it says hospitals are between 10%-15% below what they need. The consequences of this will be felt in planned and emergency work, NHS Providers warns, with waiting lists rising and limited progress in improving performance in emergency care against the four-hour operational standard. NHS Providers also states that the requirements being asked of it financially are unrealistic. The target for the provider sector is to break even, despite an estimated deficit of £930 million having been racked up last year, according to interim figures. Indeed, in a sign of how bad things are, a survey of leaders at NHS trusts has found that just over half will be hitting their individual financial targets. NHS Providers chief executive Chris Hopson says: ‘The NHS is a can-do organisation. It has shown great resilience in treating more patients than ever before while working to protect standards of care. ‘It has also improved productivity at nine times the rate of the wider economy and delivered greater efficiency savings than other western healthcare systems. So, what does this mean for nurse leaders in the year ahead? 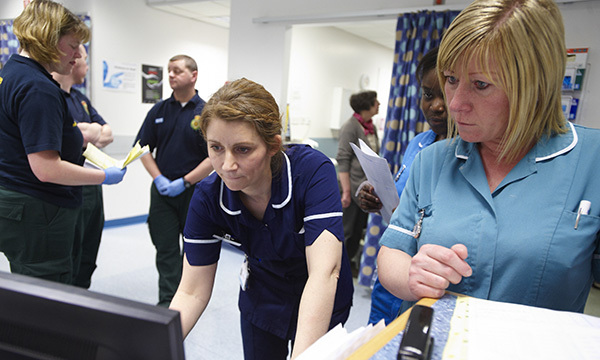 NHS Providers says there is a challenge for management as it is clear that nurses, and other staff groups for that matter, are experiencing a worrying decline in engagement and morale. Workload pressures are taking their toll with the latest staff survey showing that more than half work additional unpaid hours and one third feel unwell due to work-related stress. RCN emergency care association chair Janet Youd says this is unsurprising for those in the emergency care system, given what is being asked of the service. She says that demands, in terms of improving performance in emergency departments, are simply ‘not realistic’ and that staff are constantly under pressure to ‘turn around patients quickly’ and get them discharged. In cancer care too, the relentless slog is having an impact, says UK Oncology Nursing Society board member Mark Foulkes. He says that, while it has been publicised less than the pressures on emergency care providers, the 62-day cancer target is ‘becoming increasingly difficult’ to achieve. He says staffing shortages have hit chemotherapy nursing particularly badly. ‘You cannot easily fill these positions with agency staff, and that is why we are seeing news items such as the leaked Oxford [Churchill Hospital] memo [which raised the prospect of delays starting chemotherapy and fewer cycles being offered]. A lot of places are facing similar issues,’ he says. He adds that cancer nursing teams ‘are getting stretched by undertaking roles previously provided by other professional colleagues and dragged into other tasks, even filling staffing gaps on wards’. The government maintains that the goals set out for this year are realistic. A Department of Health and Social Care (DH) spokesperson has acknowledged there is pressure, saying ‘staff have never worked harder’. But, the DH says, the £2.8 billion of extra money announced in the autumn budget, £1.6 billion of which was for this year, and the pay award agreed with unions in March will make a difference. The pay deal is still to be ratified by front-line staff, with the results of the consultation by unions expected in the summer. But even if it is agreed, says RCN nurses in management and leadership forum chair Sally Bassett, it will not be the ‘silver bullet’ the government is suggesting. She says: ‘The pay deal was hard won, deserved and can only help. But, when it comes to being a good employer, things like supervision, support, coaching and giving staff the time to recover are more important. As a result, she believes nurse leaders and managers face a difficult 12 months, wrestling with rotas, vacancies and trying to keep services afloat with over-worked staff. ‘The received wisdom is that the NHS has some of the brightest, most capable clinical, managerial and leadership talent anywhere in the world,' says Ms Bassett. ‘If they are saying it’s not possible then it’s not. It’s madness to expect otherwise.